Some of the most successful people I know have discovered that failure is an inevitable part of success. The only way you’re ever going to get from where you are to where you want to be is to leave where you’ve always been. And leaving the “familiar” is scary. Our fear of failure keeps us stuck. The sooner we get over our embarrassment of failure, the sooner we’ll be able to get on with life transformation. You may remember the first time you got on a bicycle – without training wheels, of course – how scary it was. Everything felt so awkward. You got on, you rode a ways, and you fell. You got back on, you rode a ways, and you fell. But you didn’t quit. You stayed with it. Soon you were able to ride like the wind. Failure didn’t stop us when we were kids. Why do we allow failure to stop us now? I don’t know of anyone who lives this out in their day to day lives better than my friends Jerry and Gina. They’ve been through one of the most devastating things a couple can go through. They watched their business that had once been vibrant and profitable dwindle down to a trickle. For seven years they tried everything they knew to keep it afloat. They buried themselves in debt trying to keep their employees on the payroll. Nothing worked. They eventually filed bankruptcy. Today Jerry & Gina are two of the most positive people I know. They’re at peace with their lives – and they’re at peace with God. Today they’ll tell you their lives have never been better. Things didn’t go at all the way they had hoped. But they’ve accepted the way things are. And they trust God in the trials. And Jerry and Gina have learned one of the most powerful lessons on earth: God loves us and cares for us in ways we can never truly grasp as long as things are comfortable in our lives. “Consider it pure joy, my brothers and sisters, when you face trials of many kinds” – knowing that God’s got it. Get up. Keep going. We can embrace the trials – and failures – in life when we know that ultimately God is the One who’s going to take us from where we are to where he wants us to be. Sometimes I have weird thoughts go through my brain. One of my most recent weird thoughts was, I wonder what my last words will be. As you might have guessed, I experienced something that triggered this thought. After carefully assessing the situation, my best guess is that I was within a couple of seconds of breaking my neck. It happened in my garage. It was the day I decided to clean my garage, which is something I tend to wait to do until the stacks of debris begin to tip precariously, creating a hazardous situation. As usual, my cleaning tirade got a little out of hand. I decided to dismantle one of the storage racks so I could reconfigure it to be more efficient. The shelves on the racks are two feet by four feet, and the overall height is eight feet. The rack I decided to reconfigure had several boxes of stone cabinet knobs on the top shelf, along with a band saw, a drill press, and some other goodies I’d jammed in the gaps. I figure there were about 300 lbs. on the shelf, give or take a few. As I mentioned, the racks are about eight feet tall. What I didn’t realize is that the eight-foot vertical section consists of two four-foot sections, joined together by the shelf supports that hold the uprights securely in position. I discovered this when I removed the shelf supports. Actually, I discovered this when I removed the last shelf support. I was leaning in, whacking the last support with a hammer, when I caught a glimpse out of the corner of my eye of what was happening. The upper thin gauge metal uprights were now sitting precariously on the lower uprights, with nothing holding them together. And I was beneath the 300 lb. shelf. I quickly determined that was not a good place to be. As I gingerly backed out of my predicament, I was aware that if I bumped anything- even ever-so-slightly – I was toast. Just like in the movies, the whole assembly collapsed just as I got out of the way. The sound of the crash got Rose’s attention, and she came running to my rescue. While I can relate to both Poncho and Leo, I would love to have had something like this come to my mind, “I have finished my race, and I bid you farewell, my dear Rose, as I enter into the rest which my Creator God has prepared for me.” That would probably have been too many words, and I might not have made it all the way to the end of my thought before I died. But you get the idea. Something with a bit of flair. 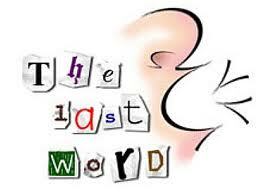 Unfortunately, we do not always know when the words we speak will be our last words. Like when we tie our shoes in the morning, or button and zip our clothes, we don’t know if we will be the one who unties our shoes or unbuttons or unzips our clothes at the end of the day. When I’ve breathed my last breath, I hope my family and friends will not have to strain their brains to remember something positive I’ve said, or something God-honoring. I hope the last words they hear me utter will be a pleasing sound in their ears—words that will bring comfort to their hearts—and offer praise to my heavenly Father.